Mary Campbell Snyder has a pair of handmade moccasins beaded by her great-great grandmother in her residence room closet. The Cree Métis fashion student has always appreciated the beauty of the beadwork on them, just as she appreciates the designs created by her second aunties. But up until last week, Campbell Snyder hadn’t fully appreciated the time and detail put into the craft. “It was harder than I thought,” she says, after beading for the first time at the inaugural Beading Circle at Ryerson University. Justine Woods, an Indigenous designer who was asked to lead the Beading Circles initiative on campus this year, describes a Beading Circle as a safe gathering space for both Indigenous and non-Indigenous people to connect, share knowledge and bead together. 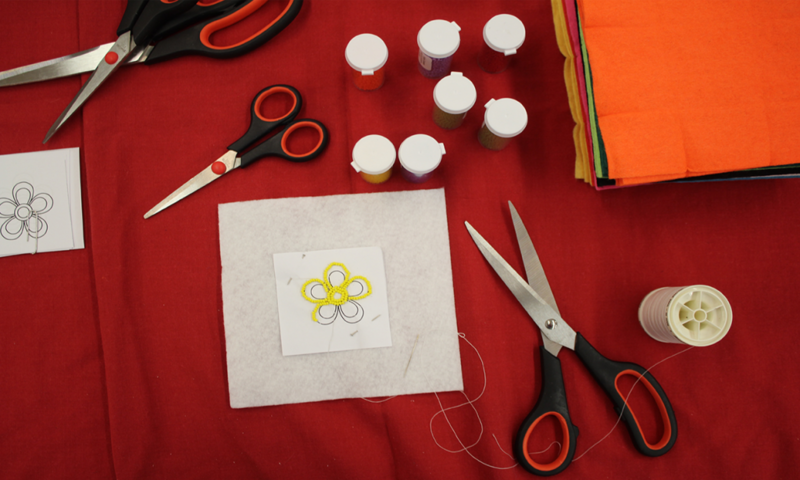 Woods, with support from the School of Fashion, is organizing four Beading Circles — the first to ever be organized at the university — this semester. Contract lecturer Anna Romanovska reached out to her last year to see if she’d be interested in running the sessions after she saw Woods’s final fashion project: a collection of tailored suits adorned with Métis hand-beaded floral designs. A dozen community members, students and staff identifying as both Indigenous and non-Indigenous, sat in desks arranged in a circle for the first evening session in a classroom in Kerr Hall on Jan. 30. Woods says she thinks it’s important both Indigenous and non-Indigenous community members develop a mutual understanding and respect for Indigenous cultures and traditions. Woods taught those new to the craft how to bead her signature flower – a Métis floral beadwork project – while others continued working on personal projects. Participants picked out beads from colourful tubes filled with hundreds of pellets, in shades of deep-sea blue, forest green, bright orange and optimist yellow, among others. Then they brought their trays, filled with colour, back to their seats to work diligently on the craft. Those in attendance shared stories and laughs with one another as their flower outlines started to form, in-between accidental needle pricks. Following the three-hour session, Campbell Snyder says she was surprised she hadn’t accomplished more besides the outline of her red-beaded flower. “It’s very meticulous and it takes a lot of patience,” Woods says, adding it takes her about 30 hours to bead a vest for her personal collection. But she says that as much as beading is about the final piece that’s created, it’s about the process of making the artwork itself. Woods learned how to do beadwork on her own and she’s since tried to teach her dad to bead. Métis people, known as the flower beadwork people, have beaded onto their clothing for hundreds of years. “(Beading) is all about storytelling … floral beadwork was adorned on Métis clothing to be able to show where a person travelled and where they’re from so a lot of it is very unique and every beadwork design is always custom,” Woods says. Métis floral beading, she added, often tells stories about the wearer or the person who did the beadwork. Woods says she’s a part of a recent resurgence of Métis beadwork artists. And by creating Beading Circles at Ryerson, she hopes to emphasize this resurgence and teach others about her Métis culture.